Freedive Socks made of Yamamoto Neoprene? 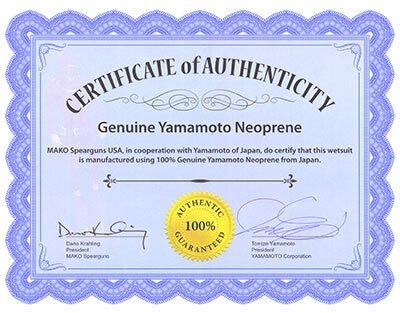 That’s right…MAKO Spearguns Freedive socks are made of “Yamamoto Neoprene”. Hey Guys, My Yamamoto freedive socks are made by the exact same factory as the expensive brands. They are available direct from MAKO Spearguns for a lot less. Same Factory – Same Quality – No Dive Shop Markup! What other socks are made of Yamamoto neoprene? There probably aren’t any. Because Yamamoto Neoprene is the absolute best material in the world, and most expensive which is why you could not find freedive socks made of Yamamoto Neoprene……………..Until now! However, because we sell direct, we are able to offer Yamamoto Wetsuits and Yamamoto Freedive Socks for less than non Yamamoto products. Even our neoprene gloves are made of Yamamoto Material. Have you ever heard of gloves made of Yamamoto neoprene? Probably not! But, you have now. How do we do it? Again, it is because we sell direct to divers. Not only do we use the best material to make our freedive socks, they are made with a 5 panel design which is by far superior to 3 panel socks. The result is a more custom like fit which provides more warmth, flexibility and durability. These are top notch for keeping the toes toasty! Any chance for a kevlar sole version? Perfect fitting warm socks. Got mine in 5 mm. Kept my feet plenty warm in cold water.